Nice Nails provides Mobile Bridal Hair, Bridal Nails, Bridal Airbrush Makeup, Bio Sculpture Nail Extensions, Shellac, Red Sky & Sienna Fake Tan for your all wedding party, or any occasion such as proms, hen nights, birthdays, or renewal of vows etc. All this done in the comfort of your own home or hotel. 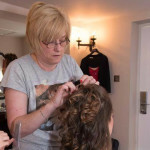 Being mobile, I travel to all areas within Droitwich, Bromsgrove, Redditch, Birmingham or Worcester and can create a style you will feel comfortable with and that will last all day and all night. Not only will I make you feel like a million dollars when you have had your hair and makeup done, but I will also ensure your fingers look a million dollars too, with the help of our brilliant bio sculpture nail extensions. Nice Nails also offers a DJ. If you need any other services please contact us. Trained by Patrick Cameron at his School of Hair dressing in London and I have also attended a local college that did both hair and makeup. 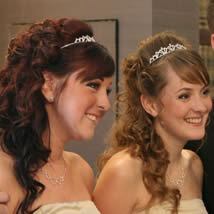 Mum of bride Gets Hair Done FREE with selected Packages in 2019. Check out our great value packages.